Track Expected to continue NW towards the AP/Odisha coast. Very favourable Equatorial flow will produce extreme rains in SW and S quadrant. Wind shear minimal now. Warning: As the system moves, it will intensify into a cyclone by Wednesday Night/Thursday morning. Very heavy rains likely to commence on the Odisha and North AP coast from Friday. very squally and damaging gusty winds that could go up to 150 kmph along the coast at time of landfall. 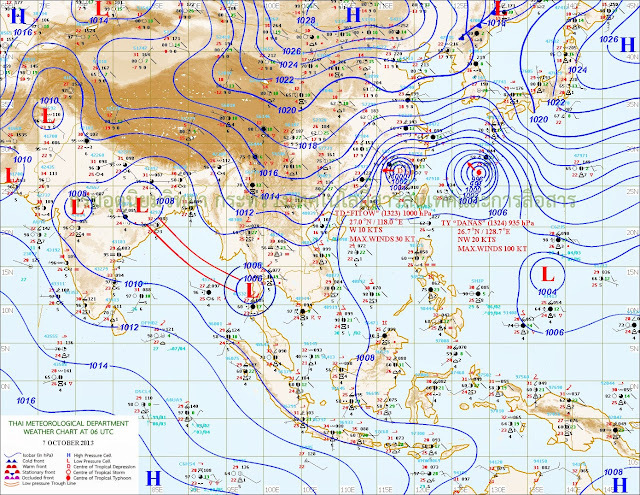 Landfall as of now expected around Saturday,12th October. Heavy rains expected along W.Bengal coast on Thursday evening onwards. Another Posting of SWM withdrawal from Delhi tonite by 11 pm IST..
BB-15,(02B), a deep Depression, is located at 13N and 93.5 E, thus having tracked NW. Current location is 170 kms N/NE of Port Blair. Core pressure is estimated at 1000 mb, and is of T2.0 intense. Core central winds are estimated at 60 -65 kmph, but gusting to 80 kmph. Cloud heights have increased due to force convection, and cloud tops are at -80c. 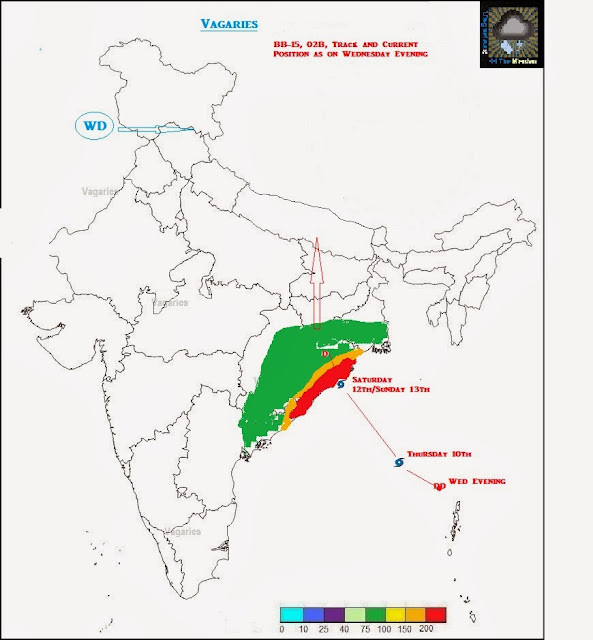 Favoured conditions show NW track to continue and head towards Odisha..
Next Report at 9 pm IST with map of track and estimated areas of possible effected regions and heavy rains. 2. Axis runs from Gujarat thru Chattisgarh and into BB-15. Embedded UAC over Gujarat and Chattisgarh, almost forming an upper trough parallele to sea level trough. All parameters (barring 1) favour a SWM Withdrawal from Haryana and Delhi regions, West UP.....more in Note tonite.. Since last Vagaries' report at 1.30 pm IST, Depression BB-15 has moved to location 12N 94.5E, that is due westwards. In hrs system has moved 100 kms , and is T 1.5 strength, 1003 mb..Core winds at 35-45 kmph and clouds higher in height having top temperatures of -80c. The vertical wind shear (resistence) has decreased even more, and is between 5-15 knts. BB-15 will graduate to Deep Depresion tomorrow (Wednesday). Track will be NW, and cross the Andaman Island chain North of Port Blair. Though, the S and SW quadrant are showing very intense clouding and heavy rains over the Islands. Port Blair recorded 91 mms till 830 am IST on Tuesday and 43 mms on Tuesda till 5.30 pm. Chennai can get some showers form the "outer bands" when the system is en- route to the coast. That calculates to some gusty showers on Thursday/Friday. (All calculations on Current situation and position). BB-15 ( Depression): slight deeper, at 1002 mb, than our 10pm IST report. 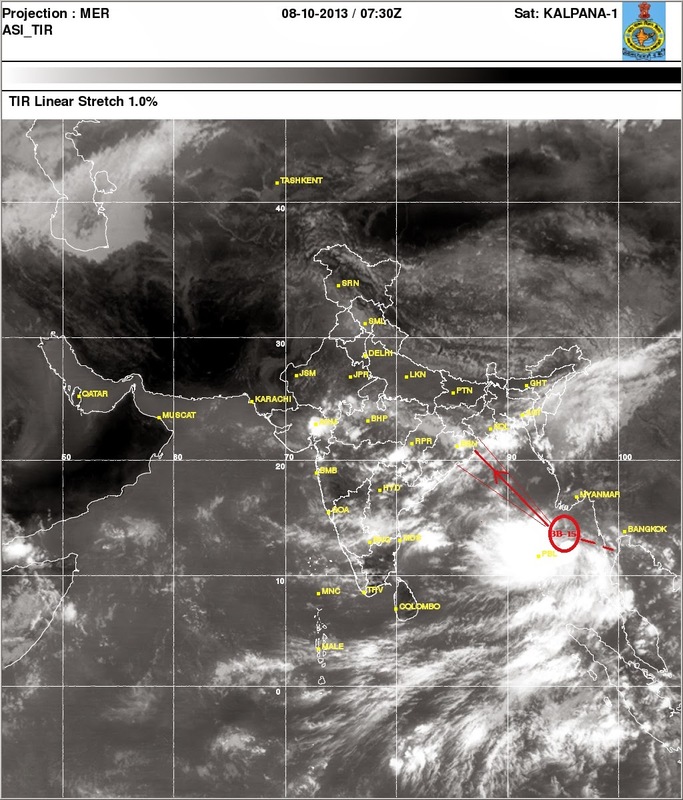 Having moved to 12N and 96E, it has shown a W/NW directional movement by about 90 kms. Now, having to encounter 20 kts vertical wind shear, which is less than its previous position, it can show tendency to get deeper soon. Current cloud top Temperatures are -70c. Core winds at 35-45 kmph, it is showing convective band formation at SW of core. Band convergence in SE is taking shape. Next report on BB-15 at 9 pm IST. BB-15. As a low pressure area at 1006 mb, has entered the Bay waters. On latest evaluation it is located at 11.5N and 97.5E. Winds at core are 15 knts. Clouds convergence seen building around centre. Though organised bands are still not prominent. However, some wind shear is seen near the system, and prominent shear is seen in the mid levels. Seeing the other factors, the system would move N/NW initially, and maintain strength at 1002/1004 mb. Later, it can curve NW around 14N, and track towards Odisha/Bengal coast. 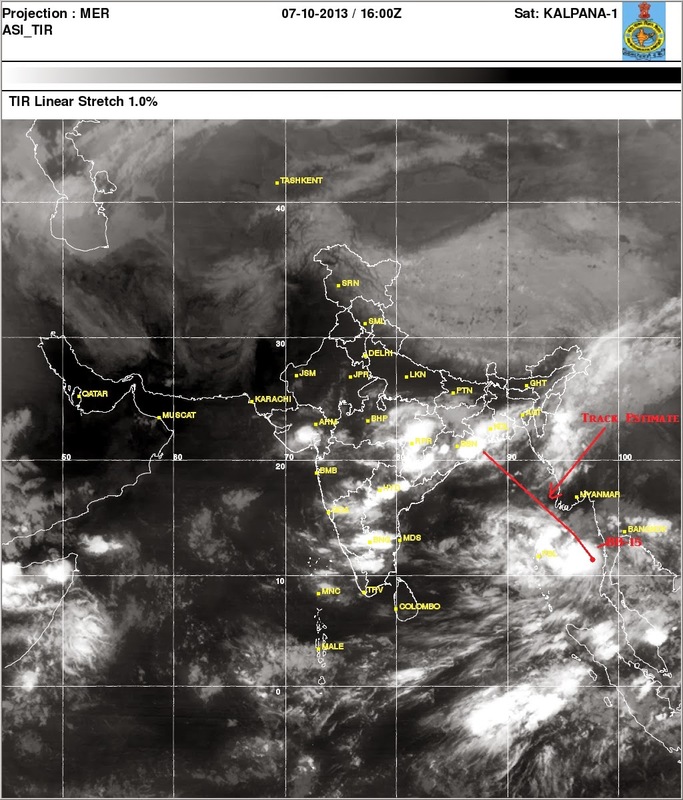 In the previous article, we had mentioned about the Monsoon axis slidig towards Central India. The axis has placed itself in the central India region. Now, we wait for the next development: the UAC formation in the axis ! I estimate the formation of a UAC around MP, and head....west ! Rohit's Page just Uploaded with very interesting Details of Mumbai-Pune region rainfall for this Monsoon...Very Imaginative Diagrams...See Rohit's Page.. Moderate rains started in Vasai. NRL has upgraded the chances of development of cyclone in hay to "MEDIUM". Now what rajesh sir? SHOULD we in bengal brace for the worst? Rains restricted only in Vasai (west ) Vasai (east) is completely dry and somewhat cloud free. at least at the moment, and also towards the sea side itis very dark and dense cloud cover is present. the monsoon is going on and on. one result of this is the higher than normal minimum temps for Kathmandu. Yesterday it was 17 C, today its 19 C, but this time last year it was already 15 C on 8 OCT and falling. Last year, by 15 OCT, it was down to 12 C, and by 25 OCT had fallen to 8 C.
I guess the minimum temps would remain 5 C or so higher than average till monsoon remains. It still feels like summer here, no autum like weather yet, though by second week of october we expect autum like weather with cool mornings and warm days, but till date its warm mornings and hot days. Yes Sam, you are right, if you look at the Mumbai Radar currently it clearly shows lots of spotty showers all around Mumbai, some look heavy. The city itself should witness some shower activity soon. recorded 84.1mm rain ending 8.30am today. Dahanu Oct total 215mm till today. After being dense foggy for last 3days, Badlapur received medium to Heavy rain spell from WNW for 30 mins with mild thuners & gusty breeze..
what will be the effect of BB-15 for us here ? is it going to prolong the monsoon ? bring more rains ? or thundershowers ? or not much effect ? Kalyan got heavy showers for 15 mins with One Loud thundering while dombivli just had a mild showers. Heavy Rain spell in Badlapur for 30mins at 4pm today. This time no thundering and came from SW.
more.its sunny in raigad district without any precipitation.has monsoon withdrawn ? Today Thane/Vikhroli had heavy morning rains.. Mumbai never feels it is in October - it has been cool and wet..enters into 5th month of monsoon just like 2011.. There might be increase in showers in Mumbai for next 2 days. monsoon still present in Konkan...North Konkan is getting regular showers..abhjit has pointed to 2 days very good rains in Dahanu...and Mumbai suburbs are getting regular rains .. Places in North Gujarat received good rain today. A cyclonic storm on Wednesday hit the Andaman and Nicobar islands and is expected to reach the coast of Andhra Pradesh and Odisha over the next 48-72 hours, the MET department said. 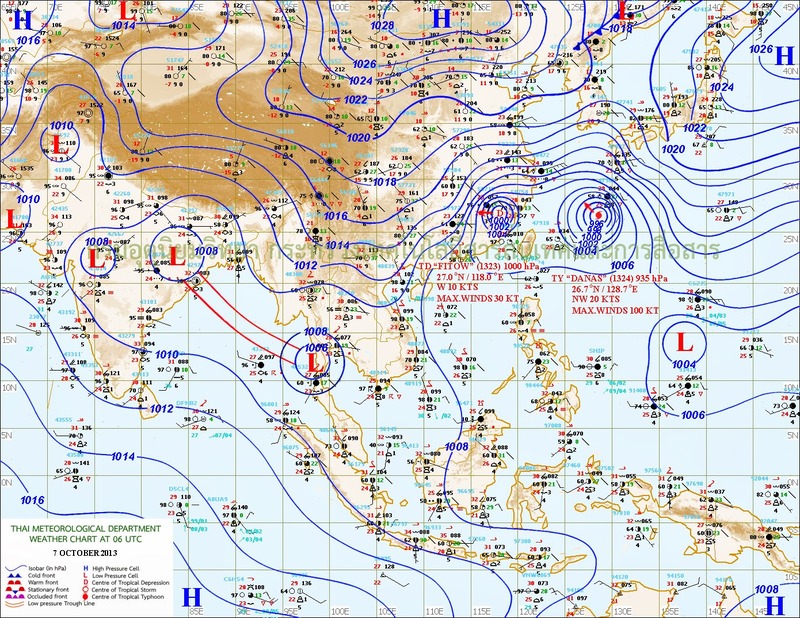 According to the Meteorological Department there was a deep depression area over the North Andaman Sea on Wednesday morning. The cyclone hit the islands near the Mayabandar between 12.30-1.30 pm. This resulted in very-heavy rainfall in the islands. 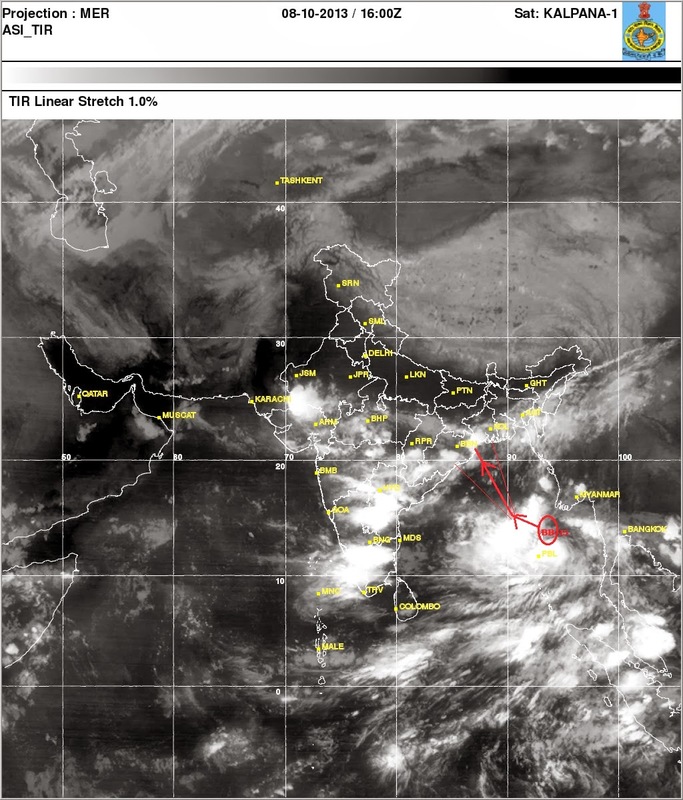 As the cyclone moves west-northwestwards in the next 48 hours, it is expected to turn into a “very severe cyclonic storm”, the weathermen said. 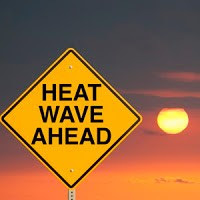 It is likely to hit the eastern coast by October 12 midnight. “The storm is likely to cross north Andhra Pradesh and Odisha between Kalingapatanam and Paradip by the night of the October 12. We are expecting the wind speed to be around 175-185 kmph. These areas will also experience very heavy rainfall,” said a senior scientist at the MET department. Hello Rajesh Sir, Today no rain here in Mumbai, SWM withdrew or what?